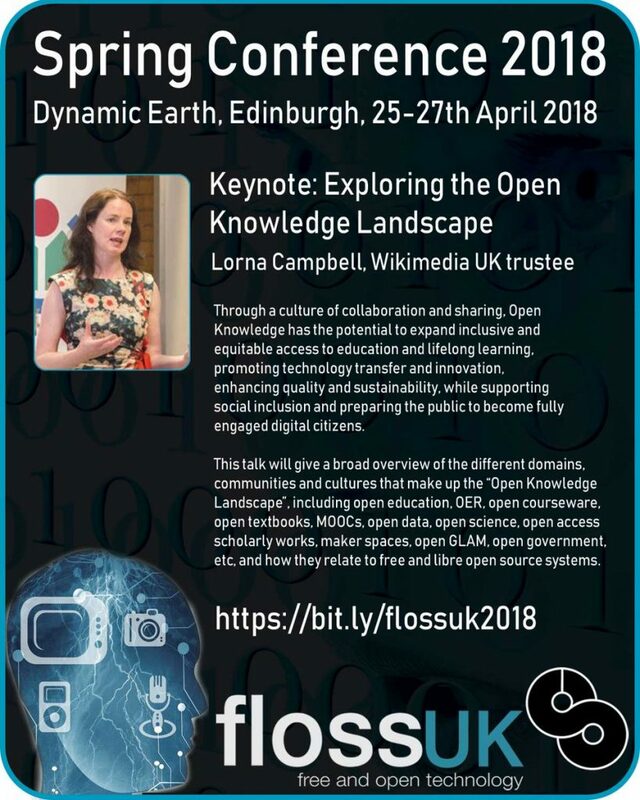 Hot on the heels of OER 18, I’m now preparing for a second keynote which I’ll be presenting at the FLOSSUK Spring Conference in Edinburgh this Friday. The title of the keynote is Exploring the Open Knowledge Landscape and here’s an overview. Through a culture of collaboration and sharing, Open Knowledge has the potential to expand inclusive and equitable access to education and lifelong learning, promoting technology transfer and innovation, enhancing quality and sustainability, while supporting social inclusion and preparing the public to become fully engaged digital citizens. This talk will give a broad overview of the different domains, communities and cultures that make up the “Open Knowledge Landscape”, including open education, OER, open courseware, open textbooks, MOOCs, open data, open science, open access scholarly works, maker spaces, open GLAM, open government, etc, and how they relate to free and libre open source systems. We have seen significant progress in many of these areas in recent years, yet there has been a tendency for many of these domains to progress in parallel, in bounded spaces, with little sign of convergence. So while Open Access mandates have had a positive impact on opening access to scholarly works and research data, open government initiatives have successfully started to open up civic data and information, and open science networks and infrastructure are flourishing, too often these initiatives fail to connect with other open communities and as a result we are in danger of creating “open silos”. There may be no one simple solution to breaking down the barriers between these “open silos” but exploring the converging and competing cultures and communities of the Open Knowledge landscape is a positive step forward to achieving a more open, inclusive and equitable society. Free, libre and open source software communities are a particularly male dominated corner of the Open Knowledge landscape, a recent survey by Github of 5,500 random contributors revealed that 95% were men, just 3% were women and 1% were non-binary. As might be expected, the conference programme reflects the make up of its community, with only 3 female speakers among 19 men. This has given me much pause for thought, as normally I would politely decline to participate in an all male panel, never mind an all male conference. However the organisers of the event are sensitive to this lack of diversity and it was for this reason that they contacted me and invited me to keynote. It’s not always easy to take positive action to address diversity and inclusion, so I think it’s important to acknowledge and support those who make the effort. I’d be lying if I didn’t admit to being a little apprehensive about the keynote, particularly as I’ll be touching on the issue of systemic bias and structural inequality in open communities, but at the same time I’m looking forward to talking to a new group of open practitioners. Wish me luck! This entry was posted in higher education, oer, Women in Tech and tagged higher education, oer, OpenEdFeed. Bookmark the permalink.